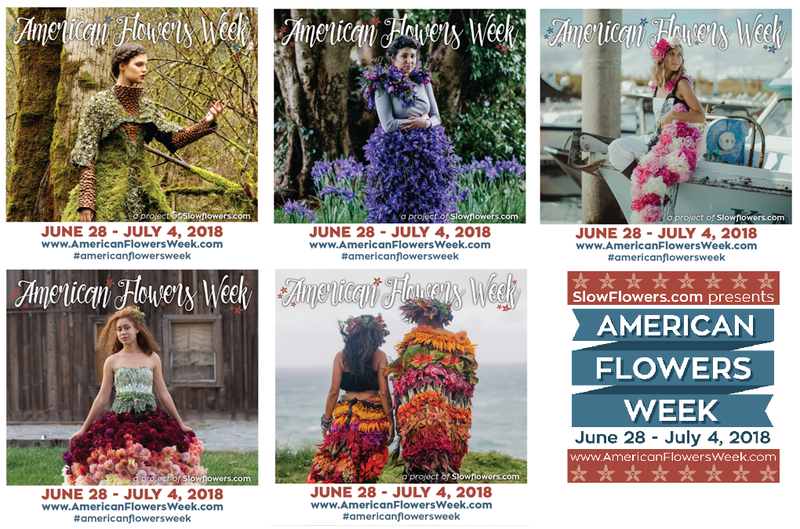 Slow Flowers will Commission at least FIVE Floral Couture Looks for our 2019 American Flowers Week Collection. 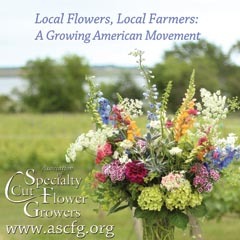 We’re soliciting proposals from farmer-florist creative teams for this campaign. 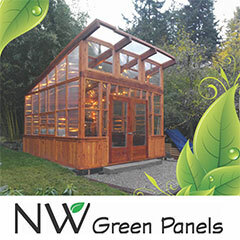 Consideration will be made for geographic diversity, and for botanical elements not previously featured. 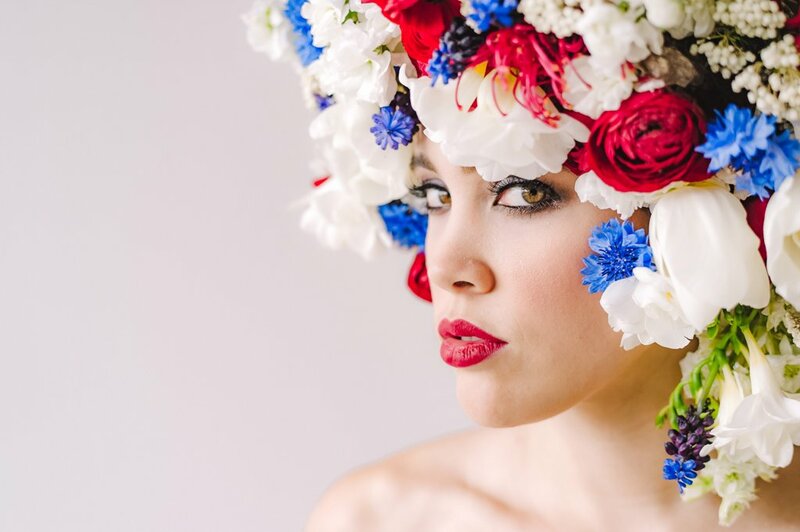 All Floral Couture Looks Must be Completed and Photographed No Later than April 1, 2019 to meet Florists’ Review publishing deadlines. 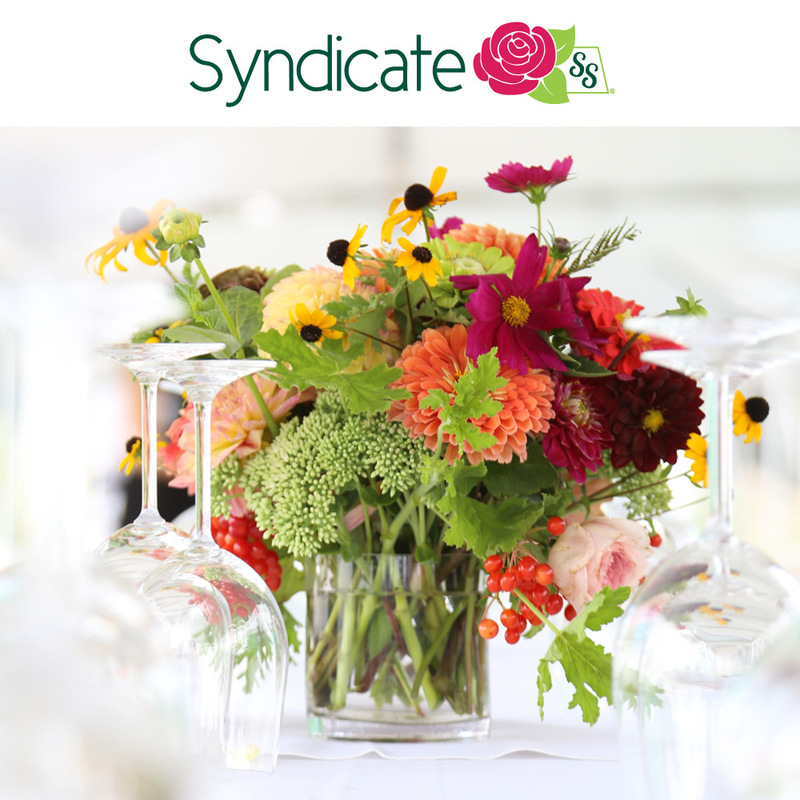 Each Team’s Lead Designer and Lead Flower Farmer will receive a 1-year Premium Membership in Slow Flowers and be featured in American Flowers Week 2019 Promotional and Editorial Campaigns in lieu of financial compensation. Last October, I spent time in Connecticut with my friends Ellen Hoverkamp and Michael Russo and Trout Lily Farm, which Michael owns with Raymond Lennox. It was a lovely evening and we hosted a Slow Flowers Meet-Up of members in the New England area. I also interviewed Michael for the Slow Flowers Podcast and you can listen to that Episode here. 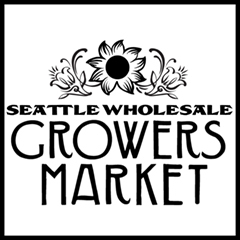 Soon thereafter, a lightbulb went off. 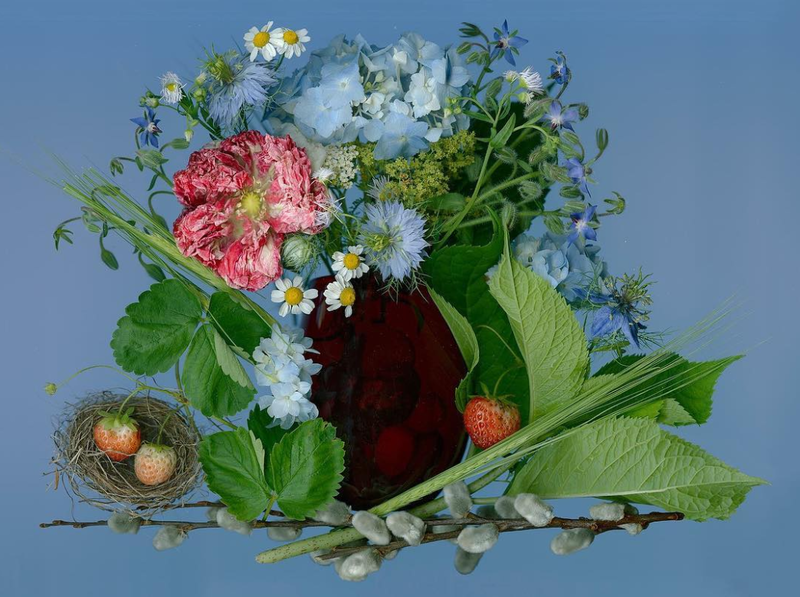 I was in the early stages of planning American Flowers Week 2018 and I realized I wanted to commission Ellen to create one of her amazing botanical still-life compositions, which she produces using a method called digital scanning, for our 2018 promotional material.
. . . the more I think about it, the more excited I am to think it’s possible to commission you to create a red-white-and-blue floral piece for our American Flowers Week 2018 campaign graphics! 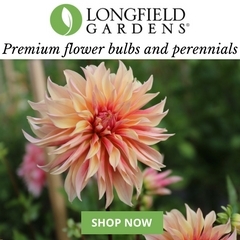 Is it too late in the season to glean anything herbaceous from Connecticut? 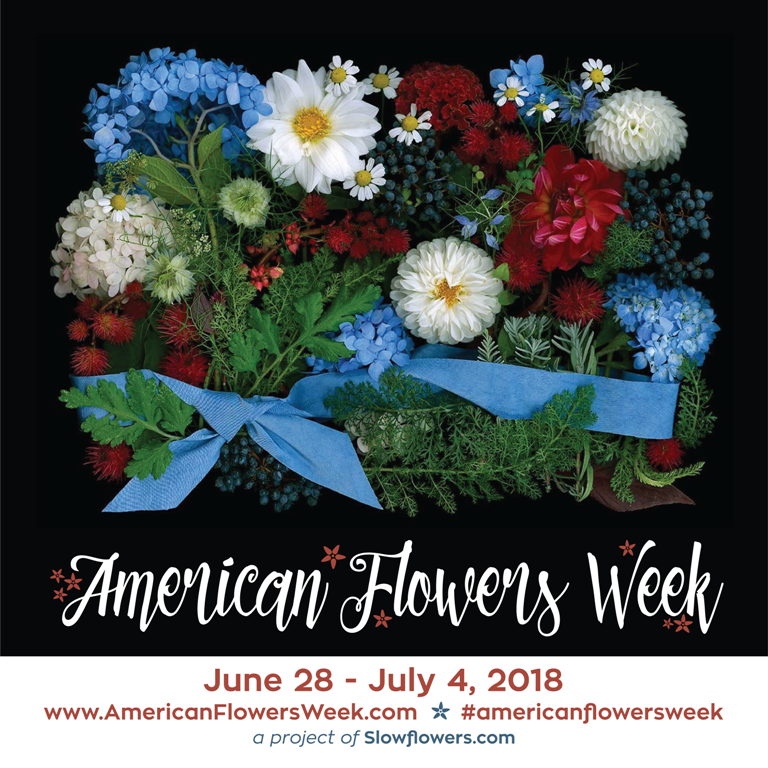 We’re so thrilled that artist Ellen Hoverkamp created a one-of-a-kind American Flowers Week botanical work for our 2018 campaign! 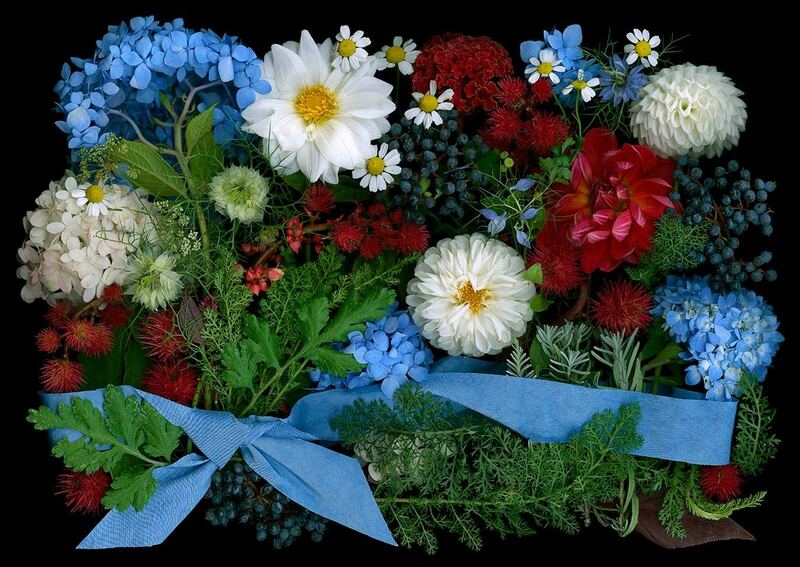 We’ve used this piece of red-white-and-blue floral art in social media and in print. 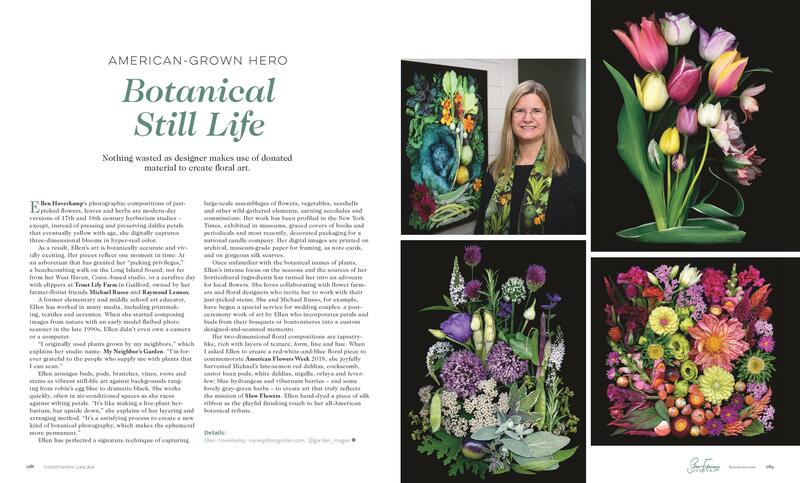 You can read more about Ellen Hoverkamp in this recent profile I wrote about her for Florists’ Review’s June issue, entitled Botanical_Still_Life. 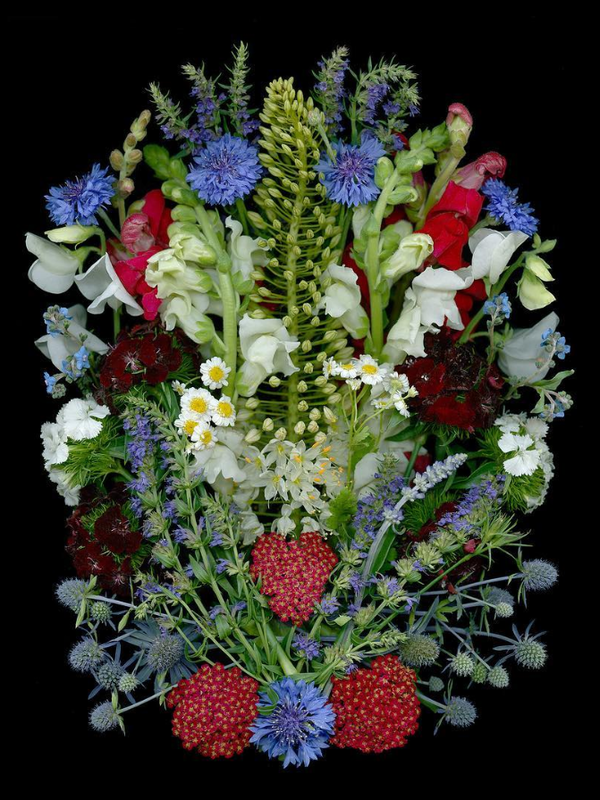 Last week, on June 28, the first day of American Flowers Week, Ellen posted her beautiful imagery on social media. I was thrilled to see it shared with so many. 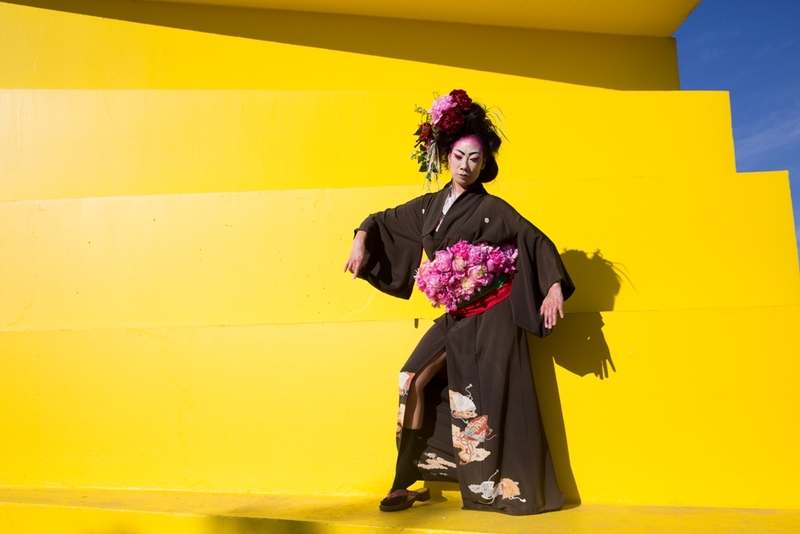 But then, she wowed the Slow Flowers Community with yet another gift. 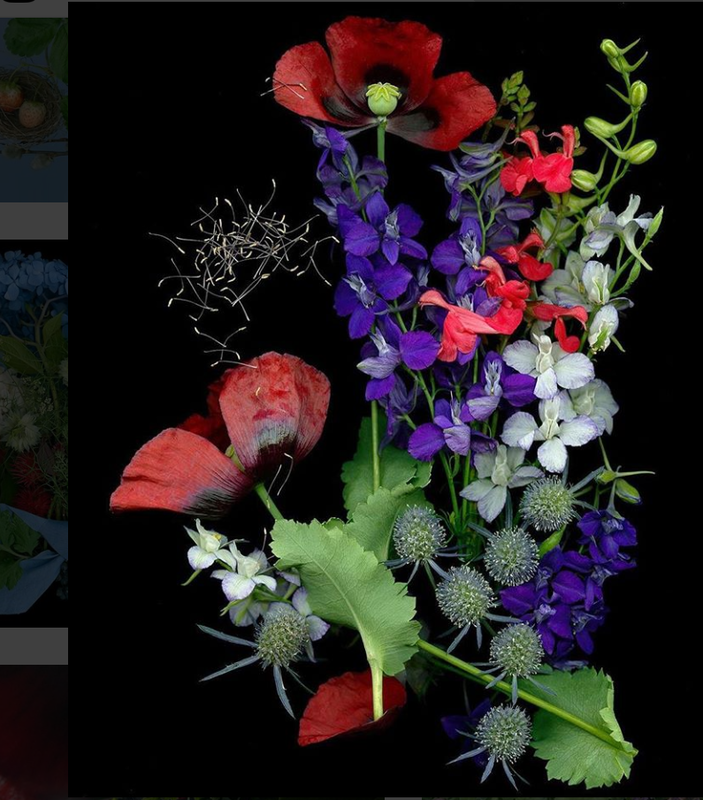 Here are the daily pieces that Ellen has created as a gift to #americanflowersweek and the #slowflowers community! 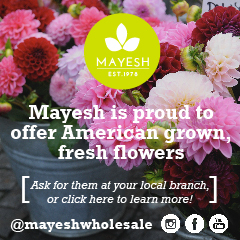 Happy 4th of July, which is also the last day of #americanflowersweek My work is made possible through the efforts and kindness of local flower growers. 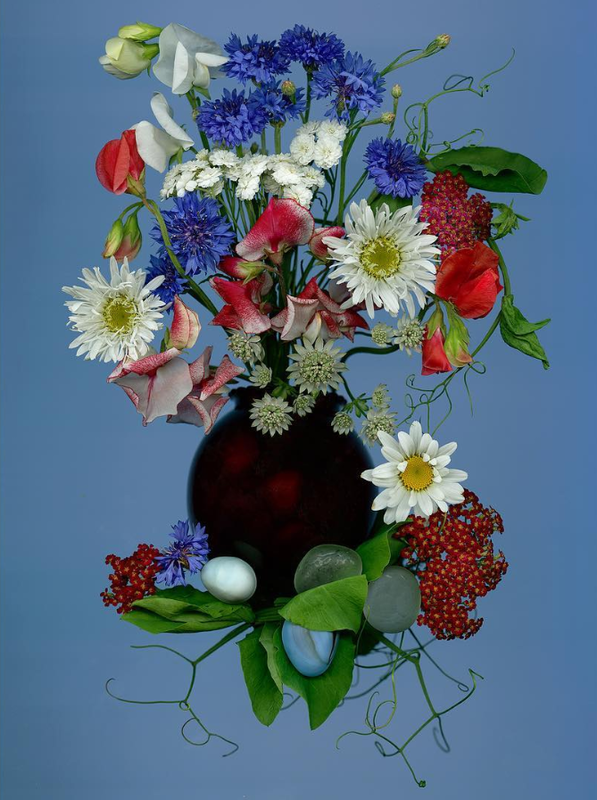 I thank you, my flatbed scanner thanks you! 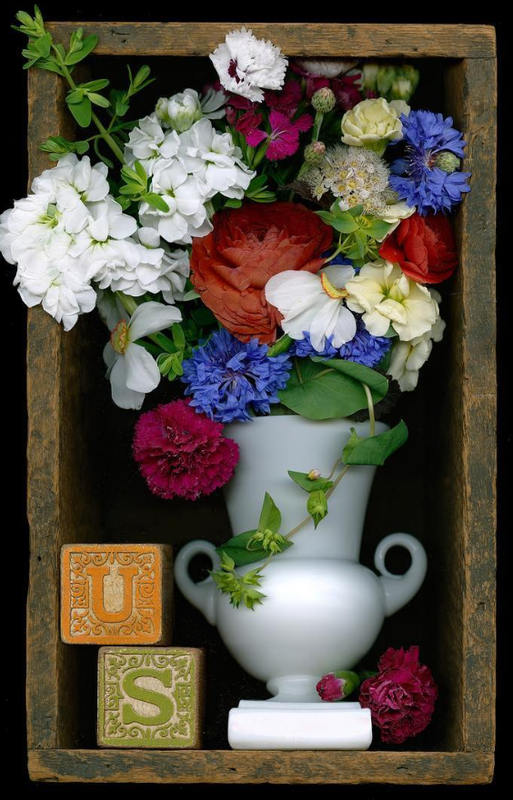 If you’re as enchanted as I am with Ellen’s artistry, visit her web site here. 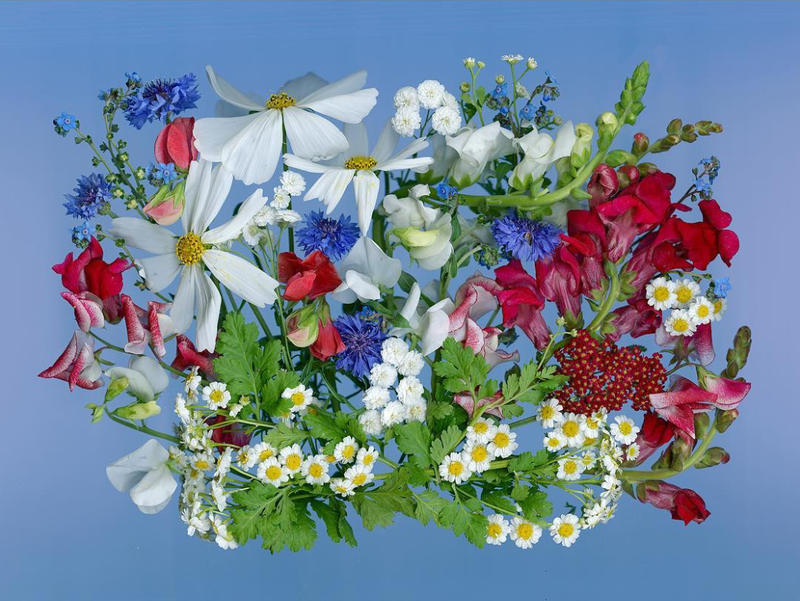 You can order fine art archival prints of her botanical compositions, as well as other lovely pieces, such as her hand-made silk scarves, note cards and more. Thank you, Ellen, from the bottom of my heart! 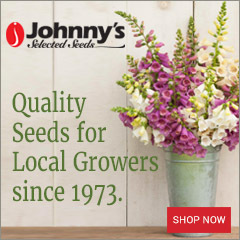 You are a Slow Flowers Hero!